Full of excitement Mrs Santa Claus waits outside the Christmas House for her friend Little Starlet. Full of excitement Mrs Santa Claus waits outside the Christmas House for her friend Little Starlet. She´s got herself all dressed-up for their jaunt around the city. The lady bear, made of vanilla-coloured mohair, is adorned by a sleeveless mini dress with two star-shaped gold buttons and arm cuffs. She is wearing an extra-long cap to match, with a larger star shaped button. What will her friend say? 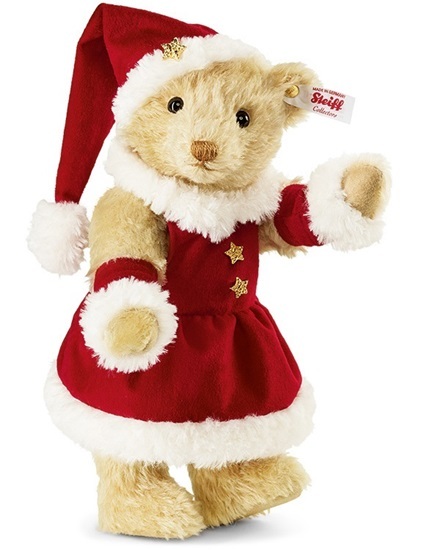 To get in the right mood she has got "Jingle Bell Rock" with her... Mrs Santa Claus Teddy bear is part of the Christmas bear series. She is 11 inches tall, with 5-way articulated joints and is a limited edition of 2015. She comes with the white tag "Button in Ear".